A. The router exchanges LMI information with the switch every 10 seconds. B. A Frame Relay peer must support Inverse ARP to exchange LMI information. C. An inactive virtual circuit (VC) status indicates no LMIs are being received from the Frame Relay switch. D. LMI signal exchanges are also referred to as keepalives. EIGRP stub routers are configured using the EIGRP Stub command. Which command can you use to verify the EIGRP neighbor stub setting? When is a DHCP relay required? Which switching mechanism caches the information that is generated by the Layer 3 routing engine even before the router encounters any data flows? When discussing PBR, what can be used to load balance traffic between ISPs? A. The path from R1 through R3 to R6 will be used, as it is the shortest path. B. R1 will equal-cost load balance across three paths to reach 172.16.2.0. C. R1 will use the paths through R3, R4, and R5 only. D. R1 will use all four paths to network 172.16.2.0, because they all have the same metric. E. Unequal-cost load balancing has been configured on R1 for three paths. F. R1 will use the paths through R2, R3, and R4 to reach 172.16.2.0. What command allows you to debug the packets associated with an ACL that has been configured at ACL position 99? What is the summary route for the following networks: 10.10.0.0/16, 10.11.0.0/16, 10.12.0.0/16, 10.13.0.0/16? How do sequence numbers facilitate out-of-order packets in TCP? Which set of commands can be used to verify both IPv4 and IPv6 configurations? Which "clear ip bgp" command is the least intrusive for resetting a BGP session after changing outbound policy for neighbor 10.4.4.4? Which command is issued on an ABR to configure a totally stubby OSPF area? Which feature is used in redundant network setups, in which multiple links exist between the EBGP neighbors? What command activates Strict uRPF and allows default routing as well as self-pinging on FastEthernet 0/0 using the access-list 199? Which step is optional when configuring policy based routing? BGP transitions through several states when establishing a session with a BGP neighbor. What does the active state indicate during BGP session establishment? A. BGP session parameter negotiation has completed. B. No response to the open message has been received. C. The three-way TCP handshake has completed. D. The BGP peers are exchanging routing updates. Interfaces in which range of IP addresses will be configured by the wildcard mask in the statement "network 10.1.98.96 0.0.0.31"? How can you quickly set the weight for all updates arriving from a given neighbor? Which statement applies to the local preference attribute? Which is a benefit of NAT? What uRPF mode would you use to prevent IP spoofing of known valid addresses based on the known network location? What are the advantages of using separate TCP sessions for IPv4 and IPv6? Which command is used to apply an IPv6 ACL to an interface? Auto-summarization is useful only in rare cases, and is not a recommended method for optimizing EIGRP. Which command disables route summarization? A. The code for the intra-area routes in the routing table is "I"
B. The code for the intra-area routes in the routing table is "O"
C. The code for the inter-area routes in the routing table is "IA"
D. The code for the inter-area routes in the routing table is "O IA"
When assigning IPv6 addresses to end users, what will the ISP typically assign? Which neighbor state are you likely to see in an adjacency with a broadcast network? A. BGP is very different from standard distance vector protocols. B. BGP uses UDP as its transport protocol. C. BGP provides reliable connection-oriented delivery. D. BGP is designed to scale to very large internetworks. E. BGP requires periodic routing updates. IF TCP thinks it is missing a data packet, what happens? Which command enables EIGRP auto-summary? Refer to the configuration given below. What has been configured? What does the "autonomous-system" command specify? Which command would set the Administrative Distance to 90 for internal routes and 100 for external routes? A router on an IPv6 network receives a package that exceeds the MTU. What is the first step in resolving this issue? How can you easily verify EIGRP route summarization? 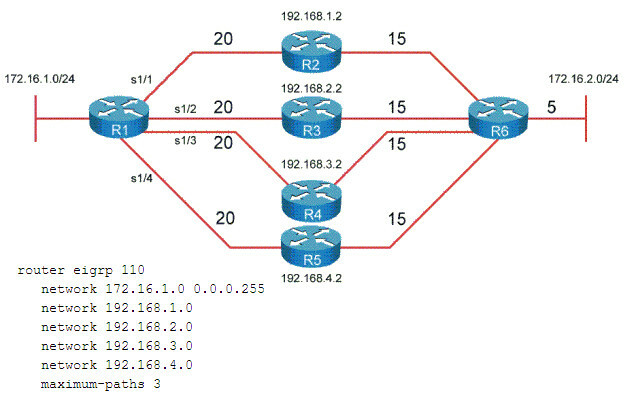 Which type of EIGRP packet is sent to all neighbors on interfaces other than the one that is used to reach the previous successor when a route is lost? You are configuring NetFlow to capture and export network traffic data. Which command would you use to format export data to accommodate NetFlow-supported technologies such as Multicast, MPLS, and BGP next hop? What is the process of sharing the information about routes that the router has learned with other routing protocols? Which command is used to configure route advertisements to specify that the IPv6 DHCP client needs to use the stateless DHCPv6 address assignment method?